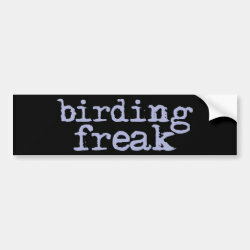 Does "freakish" describe your obsession with birds? Or perhaps your extremely refined identification skills are freakishly good? What about your shorebird ID skills? Your hawk-watching prowess? Or maybe you are just plain freaky. Whatever the reason, you know you want this birding freak swag.